NYIT (New York Institute of Technology) has been awarded $442,000 to pursue research into a gene critical in the formation and healing of bones. The United States' National Institutes of Health (NIH) has awarded Life Sciences professor Michael Hadjiargyrou, Ph.D., a multi-year grant to study a newly discovered musculoskeletal specific gene, Mustn1, and to determine its role in cartilage regeneration and skeletal repair. Hadjiargyrou's research will also begin to elucidate a new and as yet uncharacterized protein family important for cartilage and bone biology. The NIH funds will support generating genetically altered mice where Mustn1 is deleted at various stages of development. Experiments with these mice, known as knockout (KO) mice, constitute "the gold standard in gene/protein function analysis." Using KO mice will allow Hadjiargyrou's team, including NYIT students, to establish conclusively that Mustn1 is a key regulator in cartilage cells and is necessary for cartilage formation during embryonic development and also fracture repair. Hadjiargyrou has spent much of his career working at the molecular and cellular level of skeletal repair, and Mustn1 was first discovered in his laboratory. It represents a newly discovered family of proteins, MUSTANG, which stands for Musculoskeletal Temporally Activated Novel Gene. While Hadjiargyrou's prior research has demonstrated that Mustn1 is a factor in cartilage formation, he and his team are eager to take the next step: finding out its exact significance during bone development and regeneration by analyzing various conditions with and without the presence of the gene. This new grant comes from the Eunice Kennedy Shriver National Institute of Child Health and Human Development of the NIH. Some of Hadjiargyrou's prior research was also funded by the NIH. Department of Life Sciences Chair Niharika Nath, in NYIT College of Arts and Sciences said, "Funding by NIH is highly competitive. A successful grant has to put forward a new science or engineering solution to an urgent scientific need, which Michael's does. In addition, NIH requires that applicants already have a solid foundation of preliminary data from prior research." Nath added, "Receiving this grant will bring continued lab research opportunities for NYIT undergraduates in the life sciences." The bigger project behind Hadjiargyrou's research involves identifying and elucidating genes activated during the repair of a fractured bone in order to address a major challenge in orthopedic medicine: how to stimulate cartilage and bone regeneration necessary for skeletal trauma and diseases. Understanding how Mustn1 works will be a big part of that effort. 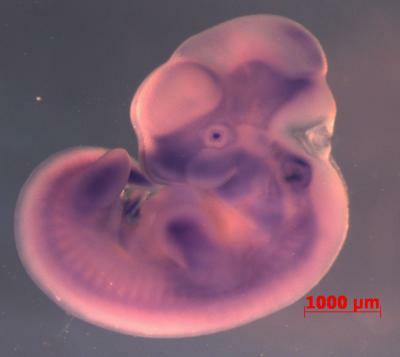 "We've worked with several genes we consider to be important in the regeneration process. We all know people who have suffered from fractures, arthritis, or other joint or bone injuries, and this research into the genomics of bone healing could lead, eventually, to new gene-based therapies." Because Mustn1 does not belong to any known class of proteins, learning more about it will be the start of understanding an entirely new protein family that is vital to the growth of cartilage and bone, and the addition of the KO mice to the lab will provide useful experimental methods for many investigators working on molecular aspects of bone-healing. New York Institute of Technology (NYIT) offers 90 degree programs, including undergraduate, graduate, and professional degrees, in more than 50 fields of study, including architecture and design; arts and sciences; education; engineering and computing sciences; health professions; management; and osteopathic medicine. A non-profit independent, private institution of higher education, NYIT has 10,000 students attending campuses on Long Island and Manhattan, online, and at its global campuses. NYIT is guided by its mission to provide career-oriented professional education, offer access to opportunity to all qualified students, and support applications-oriented research that benefits the larger world. To date, 100,000 graduates have received degrees from NYIT. For more information, visit nyit.edu.